Just ordered one 2 days ago cost £19.This is the cheapest price anywhere at £16.Also much superior to the cheaper batterys on sale that last a month or 2 max you should get a couple of years use from this one.Hopefully will save someone a few pound thats looking to buy. Same price in Tesco last night. Thanks OP, just what I was after. Ordered. good deal only a few quid but its 3 pound more for me! anyone know if this is worth getting compared to a £5 unofficial one? ONly thing i dislike about my DS4 is the fact you cannot swap out … ONly thing i dislike about my DS4 is the fact you cannot swap out batteries. Hot Deal. I thought you can just charge with usb cable now? silly question but do you need one of these to charge your controller or could you use standard usb wire. don't want to have to pay an extra £20 to have an xbox one when I already have a wire. Not without a battery pack. I think it just becomes a wired controller with usb lead. 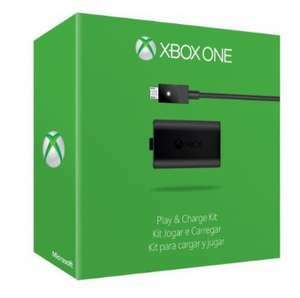 silly question but do you need one of these to charge your controller or … silly question but do you need one of these to charge your controller or could you use standard usb wire. don't want to have to pay an extra £20 to have an xbox one when I already have a wire. Was about to order yesterday for my bro @£19! Most pleased. One Click thanks then. You can't charge but you can play and use the console power with USB. This charges the battery pack when console is off and the pack lasts for aaaaages. why are you posting such daft comments? If you actually read the post I replied to it incorrectly says you need a battery. I'm clarifying that you don't need one. So its not a daft comment is it. Expired. It is now £19 by amazon.